We Won!! The USPS and Staples Deal is Over! “We wasted no time swinging into action,” Dimondstein continued. 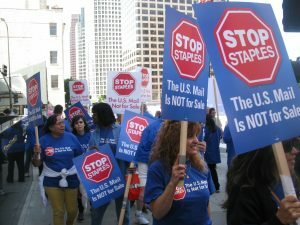 “If Staples was going to take our work and jobs for their private profit, we were going to hit back and affect their bottom line,” Dimondstein explained. The APWU launched StopStaples.com where tens of thousands pledged to join the boycott. The union also engaged in a postcard campaign which resulted in over 100,000 postcards delivered to Staples’ CEO.The entire labor movement showed great solidarity with the APWU. Many national unions endorsed the boycott including large teacher unions, the American Federation of Teachers (AFT) and the National Education Association (NEA). The other postal unions enthusiastically supported the campaign. 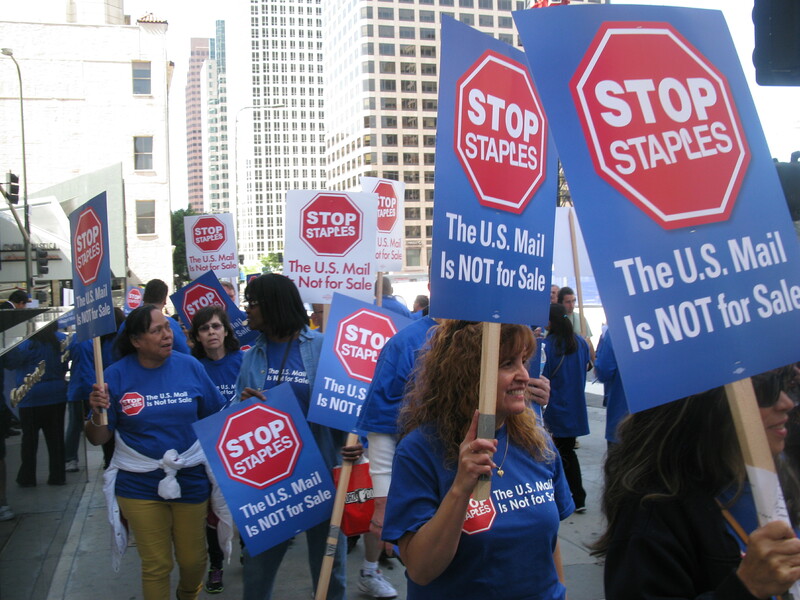 The 12 million worker-strong AFL-CIO added Staples to their official boycott list. UNI the Global Union, an international union association, endorsed the Staples boycott urging all of the affiliated unions throughout the world to put pressure on Staples, since the company does business in 26 countries. Dozens of state AFL-CIO federations, local unions, Central Labor Councils, community allies and city councils passed resolutions endorsing the boycott. The fight continued for another two and a half years, but APWU members did not give up. Constant pressure was maintained, especially in Atlanta, Boston, New York City, Philadelphia, Pittsburgh, and the San Francisco Bay Area. Protesters held signs and distributed leaflets in front of Staples stores across the country. APWU members and supporters spoke with prospective Staples customers and answered questions about what the protest was about and why they should not shop there. Many customers chose to respect the boycott.In February 2015, the APWU released two research papers critical of Staples’ proposed $5.5 billion merger with Office Depot and met with the staff of the Federal Trade Commission (FTC) examining the merger. The FTC eventually blocked the merger and Staples was forced to pay a $250 million penalty to Office Depot. “With the Staples deal out of the way, there is a fresh opportunity for postal management and the APWU to consider the future expansion and improvement of retail operations without these misguided privatization schemes that undermine great service, good jobs, and a strong postal brand.” President Dimondstein said.President Dimondstein applauds “the many local and state organizations that joined in the fight; our retiree and auxiliary chapters who stepped up with enthusiasm; APWU National officers and staff who stayed the course; and especially the many Stop Staples activists, active and retired, career and non-career, who worked day-in and day-out to see this struggle through and were the heart and soul of the campaign.